Click on links below, we may well be able to arrange to play from these pieces for your booking. NWABBA - North West Area Brass Bands Association. Our band has had recent links with Mbale Schools Band in Uganda. This was received from Philip Monk and we would appreciate you reading it. 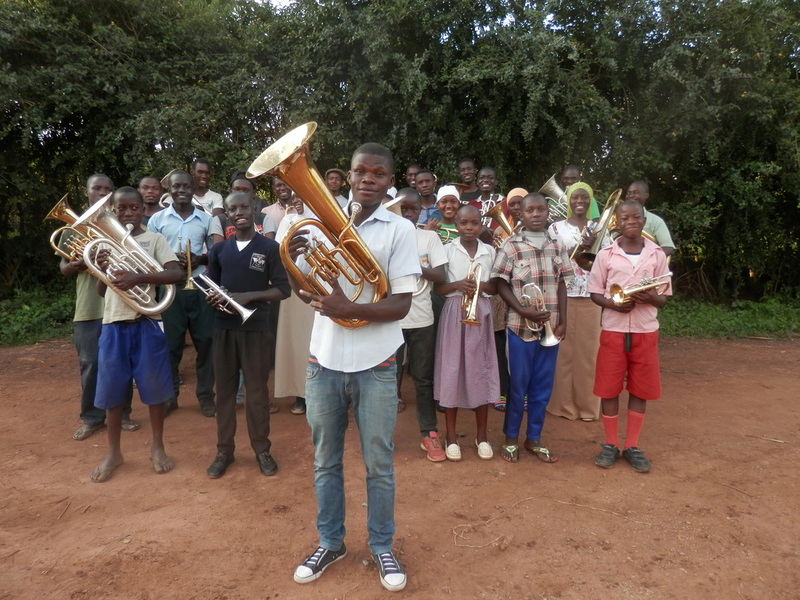 Eight years ago I stood in the middle of a field near Mbale surrounded by a group of children after had I told some of them that I was going to create a brass band. There was some interest but we had no chairs, stands, very few instruments, and no practice facilities. More importantly, the children had no concept that music could be written down on paper. We had to abandon our first practice that day as the smell of a dead dog in the field was overwhelming, and I also realised that I didn't have the right equipment to teach the kids about music theory. If you had told me then that this small group of children would go on to become the most widely seen brass band in the world on the internet I would have laughed at you. But that is what has happened. Earlier this year we recorded a march called Castell Coch and posted it on Facebook. The video has been seen by more than 1.2 million people and has been 'liked' more than 11,000 times. No other band in any country has come close to this amount of interest in what is, after all, a minority social and musical activity. Perhaps our greatest achievement is that we have transformed so many people's perception of one aspect of African society. When I return to the UK and ask people about what they think life is like in Africa, they often express a view that reflects what they have seen on TV and other media: hunger, thirst, disease, war, refugees, primitive behaviour and so on. In reality, although life can be tough or even dangerous in many countries on the continent, for the vast majority of the people here life goes on as it does elsewhere - children go to school, adults work and business takes place. When people see our children in Mbale Schools Band reading and playing classical music on Facebook they are surprised. We don't fit into the negative news stories. The children are obviously musicians. Youth music is developing. It’s this change of attitude and perception outside Uganda which is what I believe to be our biggest success. I couldn't have done it without the support of so many people in the UK and elsewhere. I would love to mention the names of all those who have helped in so many ways but it would be a long list! So now to our next challenge. Our band is famous on the internet. But the children have had almost no chance of playing for a live audience as persuading local people here to come to a concert is not easy! So we are in danger of become a 'recording only' band. Or even a virtual brass band that no one will ever see 'live'. Our objective therefore must be to play outside Africa (the band has already been on a concert tour in Kenya and Uganda). The aim of such a tour is not about the 30 players who would take part but the influence it would have on African youth as a whole. Many millions of kids in Africa see their heroes playing football for Manchester Utd, Liverpool, or the other top teams in the Premier League. These same children are inspired by the success of their fellow-Africans and dream that one day, they may also be a great footballer. In the meantime sport unites them and teaches them all the positive values of teamwork and discipline. Music can be the same. Think how many children in Uganda would want to learn to play a musical instrument if they see on the national news that some of their peers had travelled to the UK to take part in a band contest - performing in their own right against musicians from other countries. So I am launching an appeal to get the band to a European or an American country for a contest or concert tour to achieve our dream of becoming the first African band to do so. It's obviously expensive because of air fares. The main problem to overcome is that people will say that money raised towards such a tour should be spent in other humanitarian areas. But if you follow that logic, no African athletes would compete at the Olympics or at the World Cup. There are other huge charities that work in specific areas of disaster relief, medicine, and food security. We can't do that. But what we can do perhaps is change attitudes and perceptions and, through this change, make a significant difference to the cultural, artistic, and spiritual development of the children of Africa. We will need perhaps £15,000 to make our dream come true. It's a real challenge. We have a pledge of £1,000 to start the campaign. We won't raise the funds through small contributions but only through corporate sponsorship or a substantial donation from a patron of the arts. What we won’t do is spend money that is earmarked for other charity work. The Donate button on our Facebook page https://www.facebook.com/mbaleschoolsband/?fref=ts uses the same link. ....to see how far we have come on our journey. Please help us continue that journey. One of our players, Andy Liles also plays in Marple Band. Come along to their Vice Presidents’ Concert; click on link for details. ​He tells me "It's a really good programme, British themed first half and American second half." Free entry and everyone welcome. 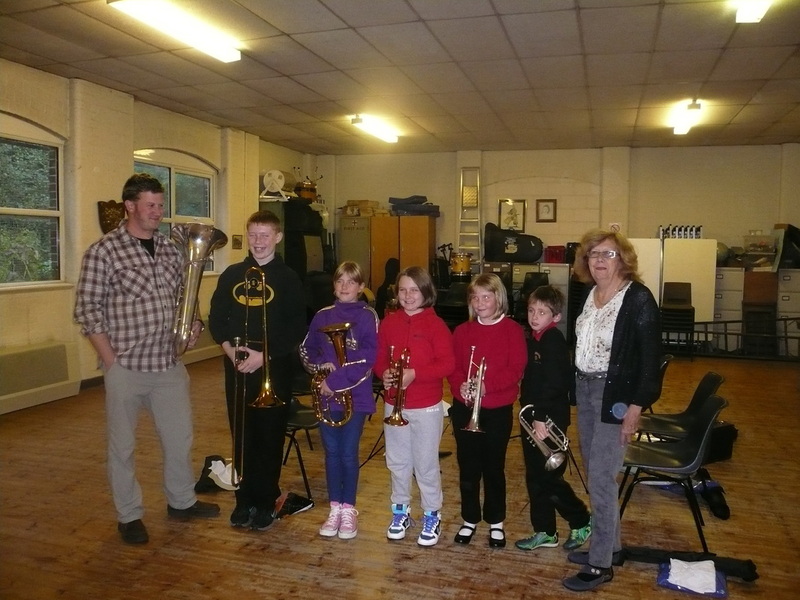 Five members of New Mills Band Junior Band received their one year's training awards from Derbyshire County Councillor Beth Atkins. They each received a music stand and a band uniform.. Pictured here are Tommy Thornley, Mia Oxley, Emma Thornley, Lilly Arnfield and Benjamin Hammond together with Councillor Beth Atkins and MD Adam Hutchins. The Junior Band meets every Monday in Thornsett Band Room from 6.30 to 7.15pm. There are lots of brass instruments available and tuition is completely free. So if you would like to learn to read music and play brass instrument, make new friends and have lots of fun do come along on a Monday evening. Lucy Pankhurst, one of our previous MD's on the BBC with some of her work. Another item of interest is that our own Darren Goodwin was once a Billerette! See this link to Billeretes web page - he is number 359 on their roll of honour.